Visitors are required to check all backpacks, briefcases, umbrellas, and other parcels that pose a risk to the art. Generally speaking that means anything larger than 11” x 14”, but is subject to the discretion of security staff. There are coat checks at each entrance. While we encourage you to engage with the art presented in the Museum, please avoid touching any artworks. Paintings and other works of art are fragile and natural oils on your skin could damage the surface. Climbing on or touching the outdoor sculptures is not permitted. Visitors to the Museum are welcome and encouraged to take photographs or video for personal, noncommercial use. Some photography may be restricted as indicated by a “No Camera” symbol on the gallery wall. Tripods, selfie sticks, and additional lighting are prohibited inside the Museum galleries at all times. 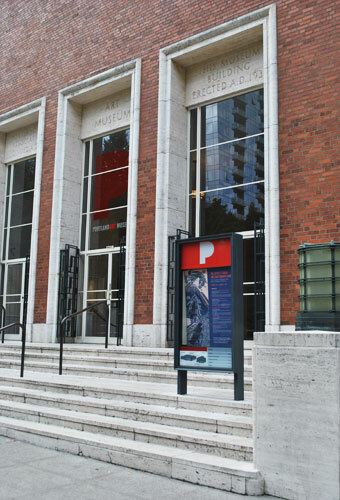 During your visit, photos and/or videos may be taken of you and your group by Portland Art Museum staff or contracted photographers to be used for education and promotional purposes. If you or someone in your party would prefer to not be photographed, please let the photographer or someone from Guest Services know. Closed circuit cameras are used throughout the Museum campus for security purposes only. Sketching in pencil, colored pencil, and charcoal pencil is encouraged. However, the use of ballpoint pens, crayons, pastel, charcoal, and wet media is not permitted. Drawing boards are allowed up to the standard size of 23 x 26 inches. While sketching, please be mindful of other visitors in the galleries. Food and drinks are permitted only in the Museum Grounds coffee shop and may not be carried into the galleries, auditorium, or other areas.